From the innocence mission’s guitarist, Don Peris, comes a spare and brave collection of original songs that are sad and strange, warm and full of wonder. Peris began this recording effort during the innocence mission tour in support of Glow. As he would journal during the tour, he would add melodies to part of the entries. 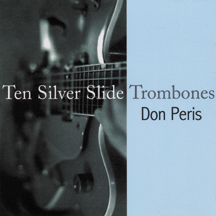 Over time, he pieced the bits and pieces together to form the songs that make up Ten Silver Slide Trombones. Don plays all of the instruments, his trademark guitar, but also banjo, bass, drums, and organ. Many of the albums songs are biographical, about specific people, events, and places and a few are written especially for his son and personal friends. Since 1989 Don and his wife Karen, natives of Lancaster, PA, have written and recorded songs with their group the innocence mission. They have 4 major label releases and have toured with Natalie Merchant, EmmyLou Harris and 16 Horsepower, among others.